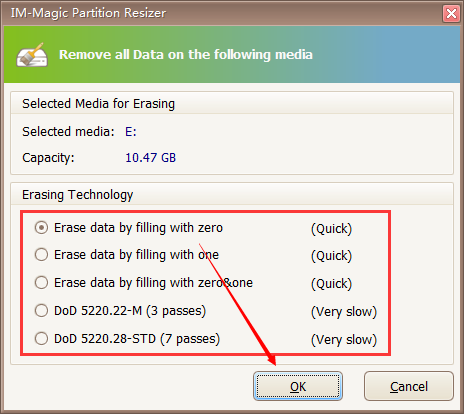 IM-Magic Partition Resizer is free to erase hard drive, wipe external usb drive without any chance of data recovery that could perfectly protect your privacy and erase data completely. Download IM-Magic Partition Resizer Server to safely remove every detail on hard drive to protect privacy without a chance of recovery. Is it possible to erase hard drive data permanently? If you want to wipe the data on hard disk forever without any chance of recovery, this article introduces free methods for you to erase a hard drive. Partition Resizer is a free disk wiper that can remove data totally and permanently without any chance of recovery by filling sectors with zero that could totally remove every byte of blocks to help protect privacy. Download this disk wiping utility on your Windows PC and then start erasing data. It works on Windows XP/Vista/7/8/10 and if you want to remove Windows Server hard disk volumes, you may download its server edition. Step 1, Download&Install Partition Resizer on your PC, open the program and then right click your disk partition that you want to erase. Navigate the mouse to ‘Wipe Partition’ option and then confirm the wiping. Note: if you want to erase the whole disk, you may select partitions to erase one by one. Wait a few minutes to let the software erase the disk information by filling 0 to the blocks. Tip: the erasing cannot be undo since this is permanent overwriting old data sector by sector by filling new data 0 and this could 100% ensure your disk privacy before sending it out to somewhere or someone. How to open command prompt windows? Once you see the disk part window, type ‘list disk’ to let it show all disk on your PC. Once it shows your disk, type ‘select disk 1’ and then press enter to get the disk that you want to erase selected. Type ‘Clean’ after the window showed your disk is selected as targeted disk. And it would start cleaning your disk information. VERY IMPORTANT NOTE: CLEANING YOUR DISK WITH COMMAND PROMPT WOULD ERASE YOUR DATA THAT YOU CAN NO LONGER SEE THEM ON YOUR DISK. If there is really big secrecy that you do not want to share with anyone in the world, destroy your disk by making serous damage to it – crash it with bricks or stones and make the inside disk to be pieces and then separate the pieces into different trash can or bury it into different locations. This should be the largest secrecy you have ever buried and it won’t be discovered by anyone, any tool, any data recovery service. Yeah, it should be done like that.